In July we paid a brief visit to the Lewisporte Train Park in Lewisporte, NL. 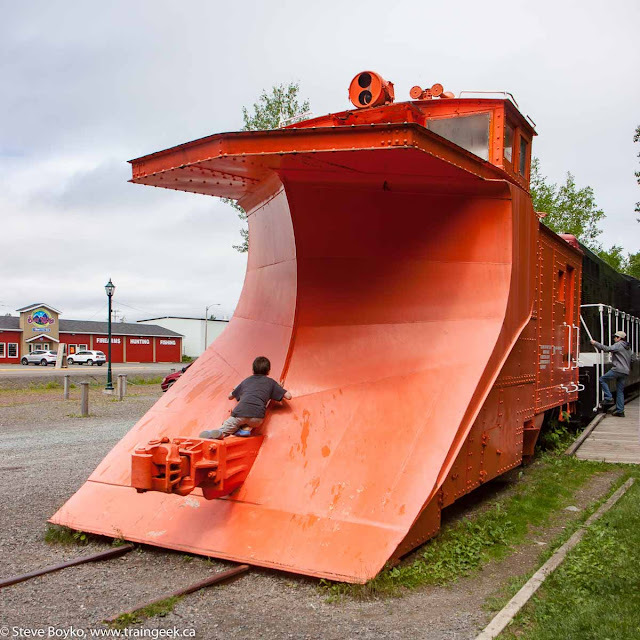 I took a different route back from Twillingate via Lewisporte to take in this railway park, and I'm glad I did! My wife and kids were happy to spend a few extra minutes as we stopped at the nearby Tim Horton's in town for a snack. Lewisporte is a bustling town of about 3,300 people. It was located at the end of the 9.4 mile Lewisporte Branch, built to provide a deepwater port for the Reid-Newfoundland Company's coastal boats. It was originally called Burnt Bay but was renamed Lewisporte after Lewis Miller, who was a Scottish lumber mogul. The branch became critically important during World War 2 with the rapid expansion of the Newfoundland Airport (now called Gander) and its importance for trans-Atlantic flights. Fuel for the important Gander airport was brought to Lewisporte by ship and travelled twice daily by "oil train" to the airport. The branch connected to mile 244 of the main line at Notre Dame Junction. After the creation of Terra Transport, the subdivision was downgraded to a spur and eventually saw its last train in 1987 and was closed in 1988. 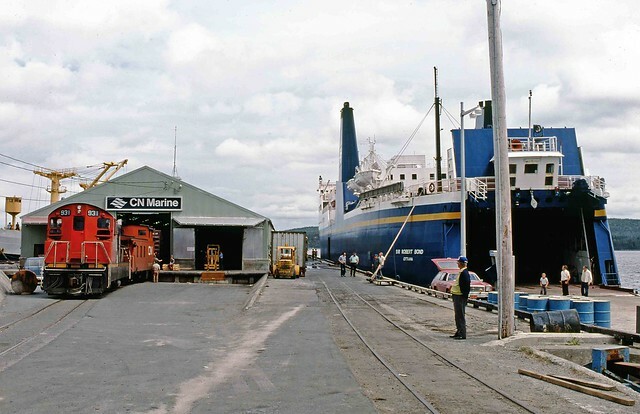 Here's a photo by James F. Primm II showing CN 931 working the CN Marine warehouse on the docks at Lewisporte. Lewisporte still hosts ferries to Labrador. The train park is located right beside highway 340 and is very easy to find. There is a parking lot next to the train and a nice walking trail behind the display. The train station still exists in the town proper, but we did not visit it. 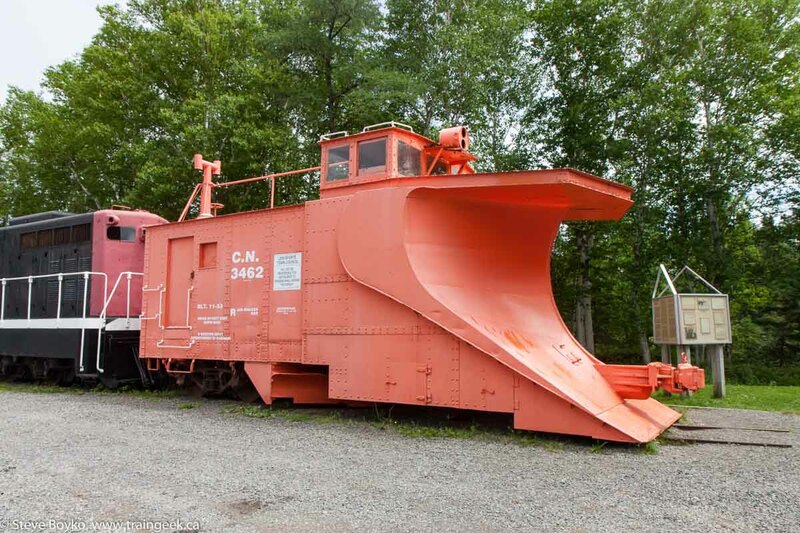 The display is headed up by the ubiquitous Newfoundland snowplow, CN 3462. This plow was built by National Steel Car in November 1953. It is unusual in that it has a lot of stenciling on it. Most display pieces lack most of the stenciling that the equipment had when in railway service. 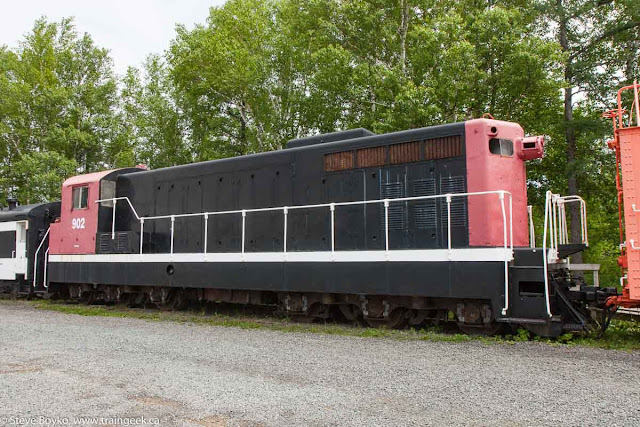 The locomotive CN 902 demonstrates this lack of stenciling. It's surprising that CN 902 doesn't even have the zebra or Terra Transport markings. The far side doesn't have a number at all and the window is boarded up. Note the lack of number boards, too. Perhaps this is undergoing restoration, as Brian Hiscock's photos from 2000 show it with a CN "noodle". Unlike most of Newfoundland's branch lines, the Lewisporte Branch could operate the heavier NF110 and NF210 units (~100 tonne), because it had a minimum of 70 pound rails. Most branches could only support the lighter G8 (66 tonne) locomotives. 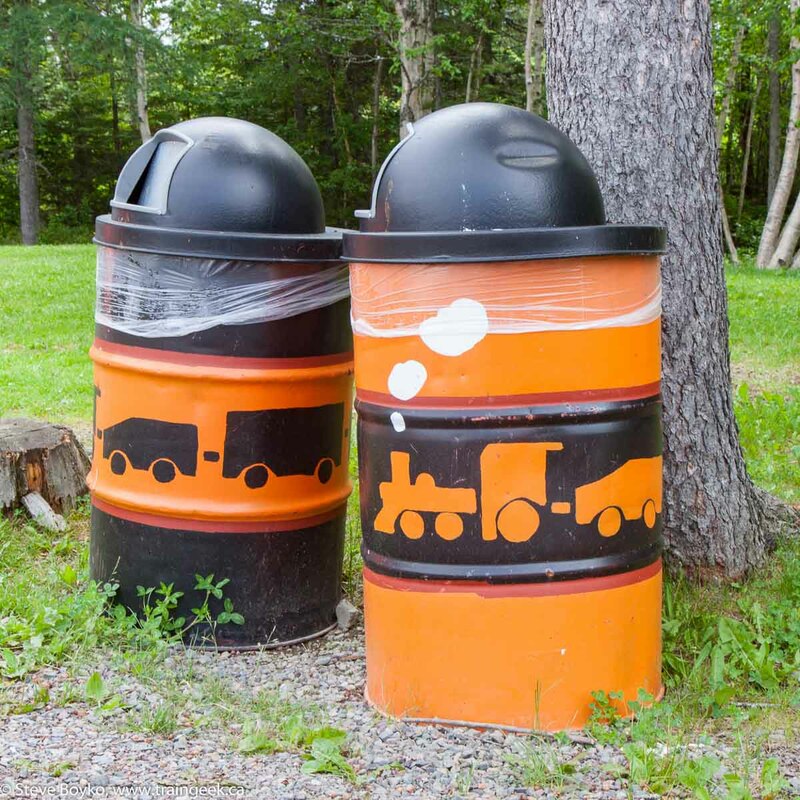 I liked how the garbage cans were railway themed! The sole passenger car is next. 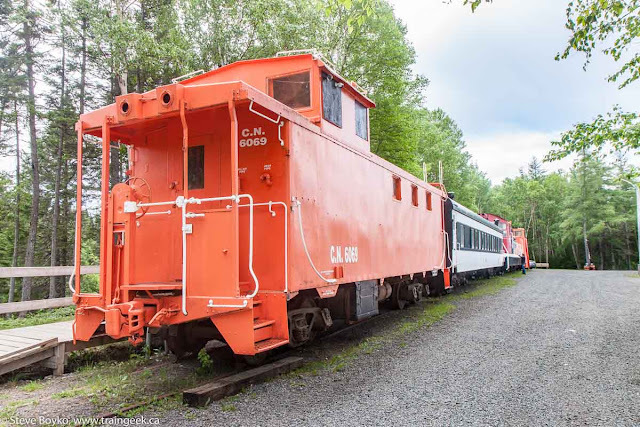 Coach CN 764 was built by the Canadian Car and Foundry company in June 1949 for the Newfoundland Railway as #47. I peeked in the windows and the seats are still inside. Note that there would not be a passenger car on a plow train, as this is strictly against the rules. I understand it was commonly done during the Newfoundland Railway days but banned after Canadian National Railways took over the island's railway. Caboose CN 6069 was built in January 1967 by National Steel Car. The plow apparently makes a nice play structure! The bold Terra Transport logo was evident on the passenger car. I'm almost done describing the Newfoundland railway sites that we visited. The last to come is Bonavista. 902 used to have a large "CN" noodle on the hood but was painted over a few years ago during a spruce up, and has not been reapplied. 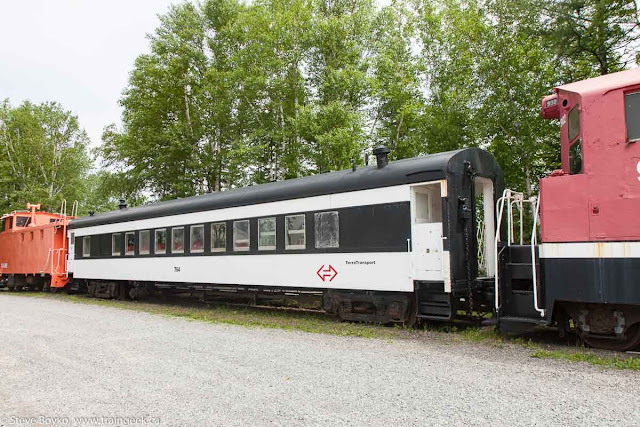 The cab sides and roof are also painted red when they should be black, this happened back in the 1990's during a repainting. Also the TerraTransport logo on he coach is way too thin. Still a nice display though. Hi shnorth123 thanks for the comment. Hopefully 902 will get her noodle back. I can't complain too much about how display equipment gets painted - at least it is being maintained and preserved.